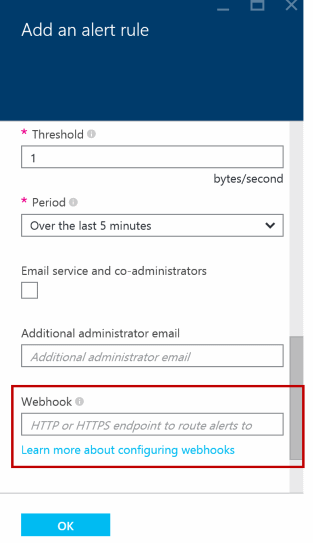 You can use webhooks to route an Azure alert notification to other systems for post-processing or custom actions. You can use a webhook on an alert to route it to services that send SMS messages, to log bugs, to notify a team via chat or messaging services, or for various other actions. This article describes how to set a webhook on an Azure metric alert. It also shows you what the payload for the HTTP POST to a webhook looks like. For information about the setup and schema for an Azure activity log alert (alert on events), see Call a webhook on an Azure activity log alert. Azure alerts use HTTP POST to send the alert contents in JSON format to a webhook URI that you provide when you create the alert. The schema is defined later in this article. The URI must be a valid HTTP or HTTPS endpoint. Azure posts one entry per request when an alert is activated. To add or update the webhook URI, in the Azure portal, go to Create/Update Alerts. You can also configure an alert to post to a webhook URI by using Azure PowerShell cmdlets, a cross-platform CLI, or Azure Monitor REST APIs. status Y Activated, Resolved The status for the alert based on the conditions you set. context Y The alert context. timestamp Y The time at which the alert was triggered. id Y Every alert rule has a unique ID. name Y The alert name. description Y A description of the alert. conditionType Y Metric, Event Two types of alerts are supported: metric and event. Metric alerts are based on a metric condition. Event alerts are based on an event in the activity log. Use this value to check whether the alert is based on a metric or on an event. condition Y The specific fields to check based on the conditionType value. metricName For metric alerts The name of the metric that defines what the rule monitors. metricUnit For metric alerts Bytes, BytesPerSecond, Count, CountPerSecond, Percent, Seconds The unit allowed in the metric. See allowed values. metricValue For metric alerts The actual value of the metric that caused the alert. threshold For metric alerts The threshold value at which the alert is activated. windowSize For metric alerts The period of time that's used to monitor alert activity based on the threshold. The value must be between 5 minutes and 1 day. The value must be in ISO 8601 duration format. timeAggregation For metric alerts Average, Last, Maximum, Minimum, None, Total How the data that's collected should be combined over time. The default value is Average. See allowed values. operator For metric alerts The operator that's used to compare the current metric data to the set threshold. subscriptionId Y The Azure subscription ID. resourceGroupName Y The name of the resource group for the affected resource. resourceName Y The resource name of the affected resource. resourceType Y The resource type of the affected resource. resourceId Y The resource ID of the affected resource. resourceRegion Y The region or location of the affected resource. portalLink Y A direct link to the portal resource summary page. properties N Optional A set of key/value pairs that has details about the event. For example, Dictionary<String, String>. The properties field is optional. In a custom UI or logic app-based workflow, users can enter key/value pairs that can be passed via the payload. An alternate way to pass custom properties back to the webhook is via the webhook URI itself (as query parameters). You can set the properties field only by using Azure Monitor REST APIs. Learn more about Azure alerts and webhooks in the video Integrate Azure alerts with PagerDuty. Learn how to execute Azure Automation scripts (runbooks) on Azure alerts. Learn how to use a logic app to send an SMS message via Twilio from an Azure alert. Learn how to use a logic app to send a Slack message from an Azure alert. Learn how to use a logic app to send a message to an Azure queue from an Azure alert.